Want to cuddle with Michelle A? Note that I live in Central Virginia, but I make regular trips to North Carolina, Tidewater VA, northern VA, and MD for sessions. I am interested in organizing trips to other areas which currently don’t have a professional cuddler. Feel free to contact me if you are interested in getting in on a trip if you are within a half day’s drive from my home in Hadensville VA. I have a deep belief that everyone deserves to feel understood and accepted. For my whole life, people seeking that safe and accepting space have been drawn to me. I love being that person for people. We all have a different story to tell, and we each have reasons behind us being who we are. My being a highly sensitive person (HSP) provides me that special perspective and ability to empathize with the people who feel no one understands them. Beyond feeling understood and accepted, humans as a species need platonic consensual touch. In today’s society, it has become normal to be touch deprived. Touch is only to occur in monogamous relationships. This leaves people who are single with little places to turn, and even puts a strain on people in relationships when their touch needs differ from each other. After working at a desk job in the corporate world for over a decade, I’m thrilled to have found work which speaks to my inner purpose and gives me daily fulfillment in having a positive impact on other people’s days and lives. 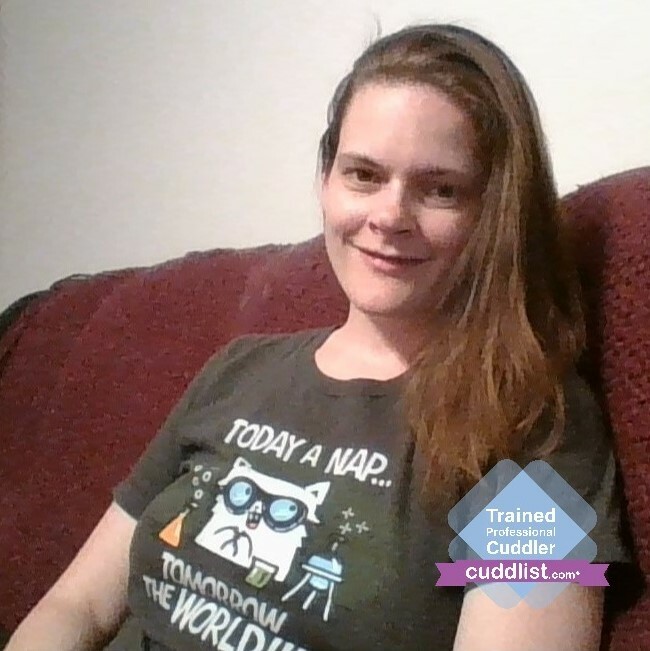 I am Cuddle Sanctuary trained and can’t wait to help you in your journey towards happiness, relaxation, rejuvenation, connection, and confidence in the value of you! After you submit a request form, you will receive an introductory email with more information and some follow-up questions to make sure I am the right fit for what you are looking to achieve in a session. Sessions are led by you; within the confines of the code of conduct and my comfort. I abide strictly to the code of conduct, offering a purely platonic experience. Every session is different, so I want you to feel comfortable communicating your needs and wants throughout the session. The common theme is comfort, relaxation, and feeling safe and accepted as your true self. My focus is always on you: conversing (especially on the listening end) or allowing you quiet relaxation, being empathetic, cuddling, and platonic touch as you prefer and enjoy. I want to help you relax, reduce stress, and feel accepted and understood. Please be ready for the session by dressing in comfortable clean clothes, and be freshly showered. You can expect me to be clean and showered, and ready to be fully present and engaged in your needs for the entirety of the session. Feel free to bring anything else that will make the session more relaxing for you – your special pillow or blanket you love, movie or TV show, music you find relaxing, etc. I will do out-calls (first 30 miles from 23067 are at a base out-call rate of $15, $1/mile each way for the following 50 miles, and $1.50/mile beyond that) or in-calls (I have a lovely screen deck to cuddle on when the weather is nice, or inside on the couch or in the cuddle room). If you come to my home, be aware that I have cats and a dog, so it will be an issue if you have allergies. Payments to be made with a credit card through Square or in cash no later than the start of the session. Cancellations must be received at least 24 hours in advance to avoid the 50% cancellation fee. I am available seven days a week, 10am-10pm (surcharge for sessions after 5pm on M-F and Sa-Su).